A Nasa space capsule carrying captured particles blown off the Sun has crashed back to Earth in the Utah desert after its parachutes failed to open. The $264m Genesis mission spent more than two years gathering the solar material to help scientists understand the origin of the Sun and the planets. 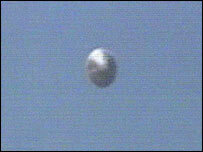 Hollywood stunt pilots had been waiting to catch the capsule in midair to give its cargo a special soft landing. The US space agency is now setting up a review board to study what went wrong. Officials said it would be some time before they knew if some, or any, of the science could be recovered. "We estimate that the capsule hit the ground at about 193mph (310km/h)," said Chris Jones, director of Solar System exploration at Nasa's Jet Propulsion Laboratory in Pasadena, California. Roy Haggard, who led the helicopter retrieval team, was one of the first on the site of the crash. He found the Genesis capsule half-buried in the ground. "The canister was slightly breached - just a few inches - due to the high velocity impact," he said. "It appeared also that the science canister inside had been breached a few inches." The Genesis spacecraft ejected the sample container on time at 1153GMT (1253BST) at a distance of more than 60,000km from Earth. It was on a perfect trajectory and it entered the atmosphere as planned at 1554GMT (1654BST). Controllers clapped and cheered when their long-range cameras spotted the 190kg (420lbs) capsule in the high atmosphere. But they expected to see the incoming container being slowed by its drogue and decelerated further by a main chute. Instead, they had to watch a tumbling silver disc head for a violent impact with the desert floor. 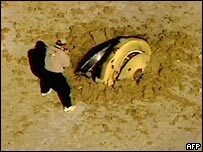 The capsule struck the ground just before 1600GMT (1700BST), a full 15 minutes before it was due to be pulled from the skies in a controlled manoeuvre by the helicopter pilots. "There are a lot of things that had to happen in series and we got just about all of them done and we just did not get the last two or three done," said Genesis project manager Don Sweetnam. "There is still hope for a science result for this mission," he added optimistically. The Genesis probe was supposed to mark the first return of extraterrestrial matter by human means since the 1970s, when Moon rocks were carried back to Earth by manned US Apollo and unmanned Soviet Luna missions. Genesis was launched in 2001. 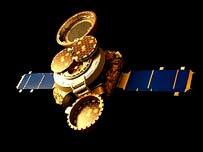 It carried delicate hexagonal wafers of pure silicon, gold, sapphire, diamond and other materials. These were hung outside the probe for more than 800 days, sifting space for 10-20 micrograms of atoms - a billion, billion of them - that had been blown off the Sun. The precise nature of these atoms were to have told scientists how the Sun and the nine major planets grew out of a huge cloud of gas and dust 4.5 billion years ago. Professor Colin Pillinger, of the UK's Open University, which was to have analysed some of the Genesis samples, said the situation looked grave because the science samples should have been opened up only in a clean-room. "The outer part of the spacecraft is carbon fibre and that is very resilient - it is basically in one piece," he told the BBC. "There could be fragments inside there that still contained some kind of scientific information. But the contamination from the desert is going to be a killer at the end of the day for the scientists." And OU colleague Dr Ian Franchi feared the wafers would have been shattered, making it difficult for any clean samples to be recovered: "Picking out the fragments that we want is the problem because there're many different types of fragment; and different types of material from different parts of the solar wind. "They come off the solar wind in different regimes; we need to know what we're analysing."